FastHealth Corporation provides a unique service that can help your hospital during emergencies. Having the ability to disseminate crucial public information during local health emergencies and disasters should be at the top of your web strategy. Our service allows properly authorized hospital employees the ability to put your hospital website into emergency mode. This means the front page of your website can be quickly altered to distribute important information about disasters or health emergencies. Another part of the service allows you to deflect your site during emergencies to local EMA websites or CDC and government websites. 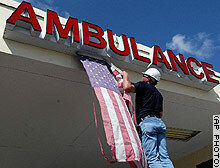 Charlotte Regional Medical Center was severely damaged during Hurricane Charley. Through satellite uplink the hospital was able to distribute emergency information about its hospital and its patients through emergency mode web services. The service can be used during the below emergencies. For more information about Emergency Mode ServicesTM please call FastHealth Corporation.